Originally developed for use in ship building, Matrix Roofing uses Glass Reinforced Plastic (GRP) to provide a hardwearing easy to install roofing solution for any roof, but is more commonly used for flat roofs and complex roof designs with lots of protrusions, such as sky lights. 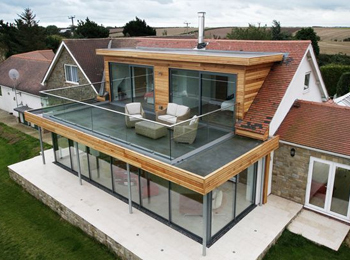 Form a new roof deck using 18mm thick boards. Apply fibreglass profiled trims to all edges of the roof to ensure nice smooth lines. Cover the main deck using a liquid resin based system which is reinforced with fibreglass matt. As you would expect there are a variety of colour and finish options, such as walkway requirements for your new roof and upon contacting us for your free quotation we can discuss the most suitable colour option for your property. Call Bondright's helpful and experienced team today on (01491) 579659 for your free quotation and colour choices for your new Matrix roof.